Sinead Bryan is no stranger to change and transformation. 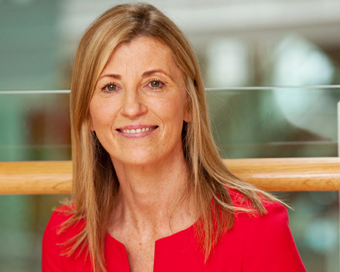 She is two years into her role as Chief Financial Officer at Vodafone Ireland, where she heads up the company’s Women’s Network. The position followed 13 years at multinational technology company Oracle during a time of massive transformation in the industry. When the opportunity to be involved in a €120 million IT and business transformation at Vodafone came up Sinead was on board. “Given my background in Oracle, with transformation and leading change this was something that excited me,” she says. However, as a mother of two young girls, it was the organisation’s culture around work-life balance that was ultimately the deciding factor. Sinead had held four senior leadership roles at Oracle. Her first during the early dot-com years was leading a financial operations team for UK/Ireland for shared services. She was tasked with leading Oracle’s first acquisitions in the Europe, the Middle East and Africa region, and guiding a team through periods of uncertainty. Moving to the role of financial director of EMEA Inside Sales, which involved leveraging Oracle’s technology to sell to customers in over 40 countries, she subsequently took up what she calls her “standout role” as Vice President of Finance for UK/Ireland before moving to VP of Finance for EMEA systems business. She had led Oracle’s Women’s Leadership (OWL), so it was inevitable that Sinead would gravitate towards Vodafone’s Women’s Network. The network hosts events to educate and support female employees; these include bi-monthly breakfast meetings and, recently, a speed mentoring event. A partnership with Connecting Women in Technology (CWIT) group with women from 17 multinationals focuses on attracting, promoting and retaining women’s participation in the technology sector. While many of those involved in the gender equality debate argue that progress is slow, Vodafone stands out in corporate Ireland; 50% of managers are female, and at senior leadership level the gender split is 63% female, 37% male. Sinead says two critical components of the organisation’s strategy are investment and innovation. As well as the €120 million IT project, Vodafone has teamed up with ESB, investing €200 million in the SIRO network, delivering superfast fibre broadband to home and businesses across Ireland. It aims to roll out gigabit fibre to 450,000 premises in 50 towns over the next three years. SIRO has set up Gigabit Hubs in 7 towns across Ireland, where companies can avail of free fibre broadband for two years. So far 29 companies have moved to these hubs, leading to the creation of 80 jobs. “Innovation is also a critical part of our strategy”, Sinead says. The company was the first to market with 3G and 4G. Early in 2018, it completed its first successful trial of 5G in Ireland. Much is made of the difficulties companies have in attracting and retaining millennials. Sinead says Vodafone is looking for talent of all ages and genders. It has a ReConnect programme for returners, mothers who want to return to the workforce after a gap of a year or more. Vodafone’s employee programmes include a 30-hour ramp-on following maternity leave and a wellbeing policy with an on-site gym. Sinead says a focus on output rather than presenteeism makes flexible working possible. She spends about one-third of her time working remotely, which allows her to avoid the M50 traffic, she laughs. Her balance is made possible by a supportive husband, her “inspiring CEO” Anne O’Leary, and “an amazing, very capable team”.